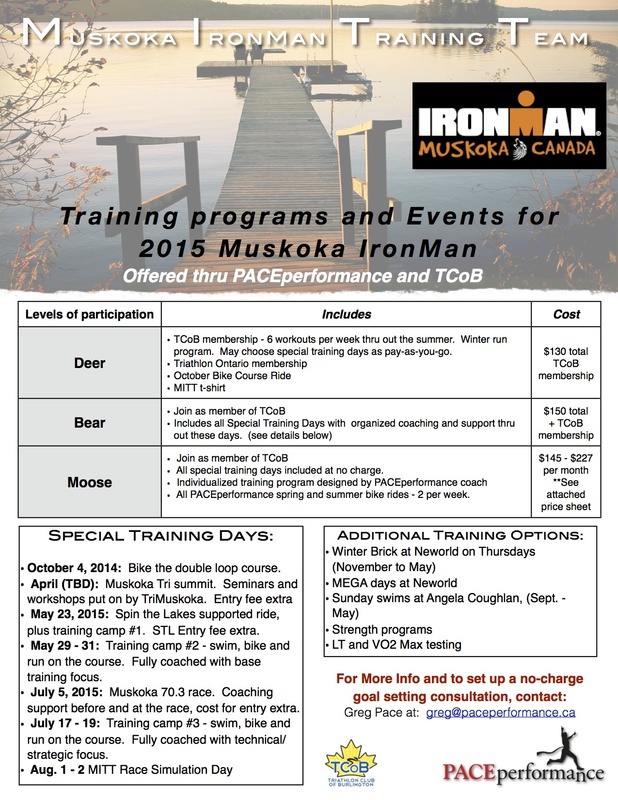 If you have signed up or are thinking of signing up for the new IronMan Muskoka, August 30, 2015, there are some great training options for you thru the TCoB and PACEperformance. Three different levels of participation allow you to train with the group a little, or a lot. Special “On the Route” training weekends will prepare you for the course and all that may come on race day. Two Pools with options for weekend, day-time and evening instructed swim programs: SWIM RIGHT, & OAKVILLE NATIONAL FITNESS have the programs to help your improve your swim this fall and winter. 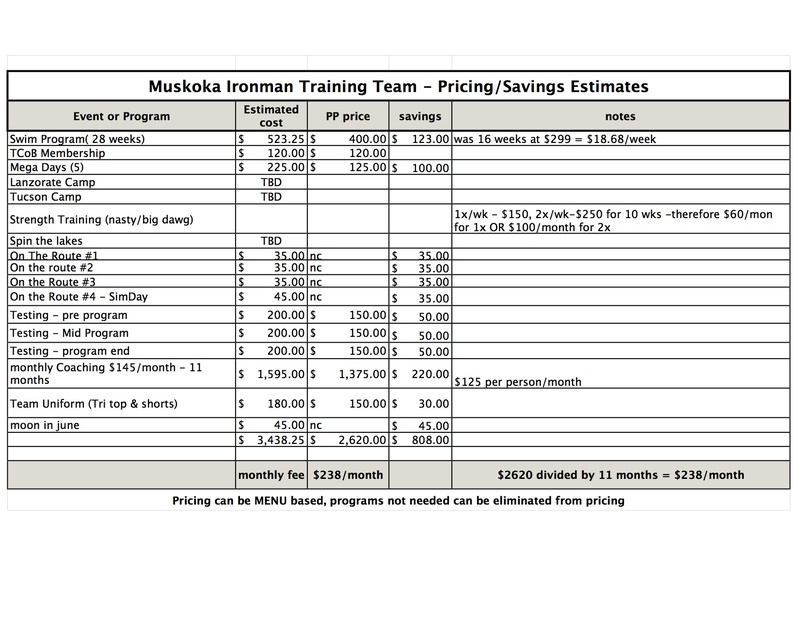 SWIM RIGHT: A Collaboration between PACE performance, TCoB, Muskoka IronMan Training Team and Neworld Tri Shop. All sessions will be coached. Workouts and tech sessions are geared to each participates ability. Each session will be a combination of 45 mins tech and 45 mins workout. (w added technical work if needed). Swimming is the only triathlon sport that does not get faster with time spent training. Increasing technique is the only way to save time in your swim. Perfect practice makes perfect. This program will have advantages for even the most accomplished swimmer. Small technique increases can be make a significant change in swim times. Ana Lemus, Coach – Ana has coached triathletes ranging from beginners to elite for over 4 years, and has competed in all distances from sprint triathlons to IronMan distance events for the last 7 years. She is an extraordinary communicator and her ability to connect with and empower people are great assets to her coaching skills. She is also a USAT Triathlon Coach, Mad Dogg Spinning Certified, Les Mills CXWORX Certified, and NCCP certified. Location: Angela Coughlin Pool, Burlington. 2425 Upper Middle Rd. For intermediate and advanced triathletes who would like to improve their speed, stamina, pacing and sighting in front crawl. For beginner swimmers who would like to improve their technique and stamina in front crawl. For more information or to register, visit Oakville National Fitness, 474 Iroquois Shore Road, or call 905-842-2366 (www.oakvillenationalfitness.com). Elizabeth Primrose, Coach – is a former member and coach at TCoB. She was the first ever Canadian Professional Triathlon Champion in 1988 and the 2011 Ontario Professional Triathlon Champion. Elizabeth is a NCCP certified triathlon, swimming and running coach. Participating in Tcob is something I dont think i could do without. It offers a hugely supportive environment creating a team atmosphere for what most people would think is an individual sport. The feeling of community at any TCOB event is so strong I think of the group as my other family... My super fit family! I am not just a better athlete for being a member but a better version of me.